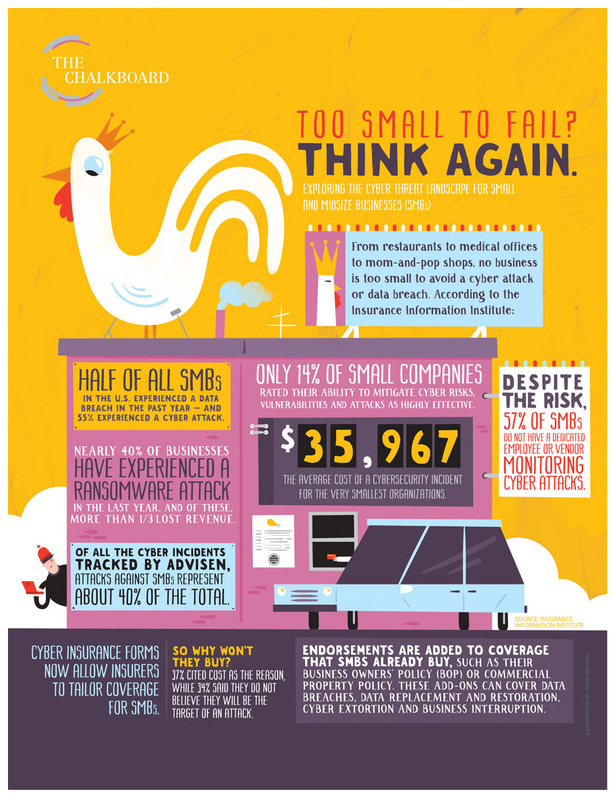 Thinking your business is too small to fall victim to a Cyber Attack or Data Breach? Research shows that many small and mid size businesses, think that their business is too small to fall victim to a cyber attack or data breach. However, according to the Insurance Information Institute, from restaurants to medical offices to Mom-and-Pop shops, no business is too small to be vulnerable. With the average cost of a cybersecurity incident costing the smallest company, $35,967. Check out the latest infographic from Property Casualty 360 on the current Cyber Threat Landscape to Small and Mid Size Businesses. The Risk Management Professionals at McSweeney & Ricci can provide you with Cyber Coverage to keep your business protected in the event of a data breach or cyber threat. Contact your Commercial Lines Account Manager for more information on a business insurance program, including Cyber Insurance coverage that is suited to your unique business needs.